Wallabies flanker Rocky Elsom has signed a two-year deal with the Brumbies and the Australian Rugby Union (ARU). The Leinster star, who was man of the match in the province's Heineken Cup Final victory over Leicester last month, had previously confirmed his intention to move back to his homeland after a one-year stint in Ireland to further his international career. Elsom, capped 40 times by the Wallabies, admitted that the lure of another Rugby World Cup appearance in 2011 was too great a prize to resist. 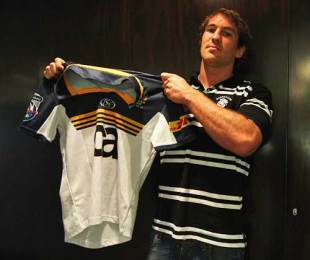 "We made progress last year with the Wallabies and there are exciting challenges ahead in 2009," he said. "Playing for Australia means a lot to me. Playing for the Wallabies is my No.1 priority." The 26-year-old featured in the Barbarians' shock 33-26 victory over England at Twickenham last weekend and will line up for the world-famous touring side again this weekend when they take on the Wallabies in Sydney. Now he is signed to ARU, Elsom is eligible for selection in the Wallabies squad despite the fact he has not featured in this year's Super 14. The timeline on any squad inclusion, and a potential return to the Test side, rests in the hands of the national selectors - Robbie Deans, Jim Williams and David Nucifora. "Any decision on Rocky's involvement with the Wallabies will be made after Saturday night because we have a game to prepare for against the Barbarians," said coach Deans. "We're pleased to have him back. We're pleased he's wanted to come back." The flanker was sad to be leaving the Irish province after a season, which saw him put in a Man-of-the-Match performance against Leicester last month in his side's Heineken Cup victory. Elsom said: "I loved my time at the club and feel very fortunate to have been part of a great team and such a successful season. "My career in the near future is in Australia with the Wallabies, but I can't say enough how much I've appreciated the support of the Leinster public and the team at Leinster." Commenting on Rocky Elsom's departure, Leinster Coach Michael Cheika said: "Rocky really wanted to stay at Leinster and also represent his country in Test Match rugby - which is the highest honour for any player. Up until today we had been negotiating with the Australian Rugby Union (ARU) to secure this scenario but unfortunately the ARU would not allow it and told him that to play for the Wallabies he had to be playing with an Australian franchise. "Rocky's desire to play Test rugby has to be respected and we wish him well with that and thank him for his contribution to the club and all its supporters. We hope to see him back in the Leinster blue one day."